There's is nothing better than the milk at the bottom of your cereal bowl. It's straight up sugary goodness. This cupcake is a lot lighter and fluffier than most cupcakes I've tried. It doesn't have the density of a store bought cupcake, so the sprinkle coloring does run, but it creates a cute tie dye effect. The cereal milk is created by steeping whole milk with the fruity cereal. I do this for at least one our for the flavor to come out. Also take note that the cereal does absorb some of the milk, so always side of making more than less as the 2 cups of milk in this recipe will yield about 1 1/2 cups of cereal milk in the end. I also added crushed cereal to the batter and the frosting to create a more homogenized flavor. Add more and less to taste. I always want more, but the taste buds in my household tend to like more subtle flavors! The crushed cereal in this frosting reminds me a bit of the Milk and Cream ice cream shop back in NYC. They create a Mc Flurry style sundae using fresh soft serve and the cereal of your choice. We couldn't believe how good it was! Sweet, creamy, and all the nostalgia you can handle in one cup! I wanted to try to replicate that idea in this frosting. The crushed cereal seems to be the key. 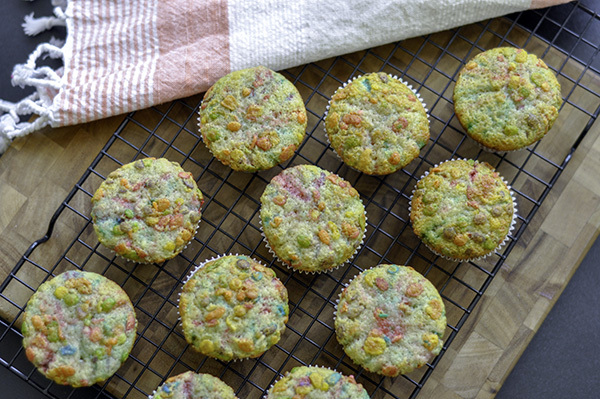 This way the cereal flavor becomes a part of the frosting and not just siting on top of it. 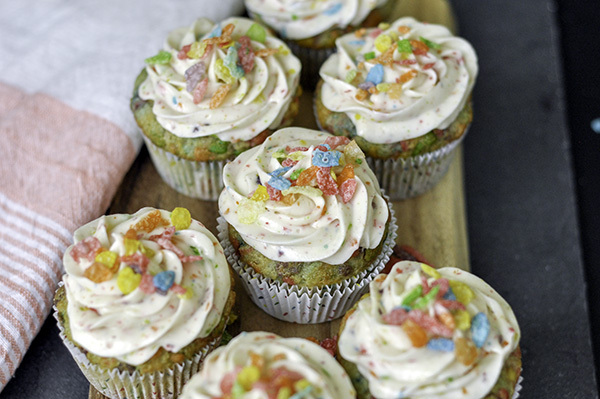 If you make it, they will come.... for this cute, fun and nostalgic cupcake. Let me know what you think and follow me on instagram for more recipes, stories and my eating out adventures! Pour milk into cereal and steep in the refrigerator for at least an hour. Set aside. Pour the mixture through a strainer and push the milk through. Set aside. In a large measuring cup, combine 1 cup of cereal milk, oil, eggs, and vanilla. Slowly Pour the wet ingredients to the dry ingredients and mix on low till they're combined. Scrape down the sides and bottom of the bowl. Gently fold in the rainbow sprinkles. Slowly pour in the water. Don't worry, this batter is very thin! While the cupcakes are cooling make the frosting by beating the butter and cream cheese in the bowl of an electric mixer. Add in the cereal and powdered sugar. Beat until well combined and fluffy. 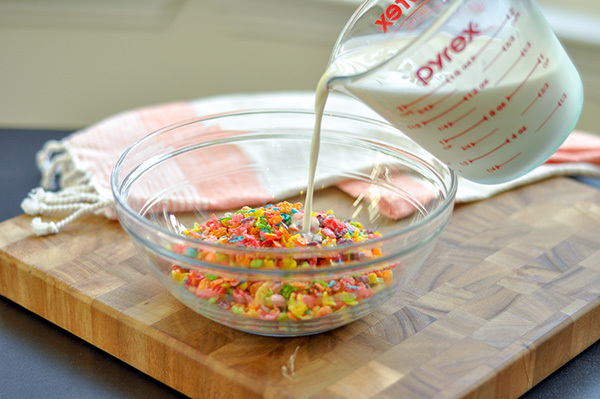 Mix in the vanilla extract and cereal milk. Spoon the frosting into a piping bag fitted with a star tip and pipe away! Top with more cereal for a bit of a crunch!